Noé Sendas, Peeps Nº1, 2012, black-and-white photograph, 15 x 12”. From the series “Peeps,” 2012. A relentless collector of images, Noé Sendas has always let photographs––drawn from cinema or art history books, for instance––play a crucial role in his videos, sculptures, and collages. Since 2010, Sendas has dedicated himself almost exclusively to photography, primarily searching out, collecting, and appropriating existing images for his works, in order to manipulate and subvert the originals as if he were sculpting a three-dimensional piece. At the heart of his current exhibition is the series “Desconocidas (Madrid 1945)” (Unknown [Madrid 1945]), 2012, which began with nearly 500 negatives Sendas found in Rastro, a flea market in Madrid. These small, intimate black-and-white photographs depict women in clichéd poses and were taken by anonymous photographers in Madrid during the 1940s. Sendas has manipulated the images by amputating the unclothed parts of their bodies, eradicating their faces, or sometimes representing each woman as disintegrating into the background. The women look almost like ghosts, blurred visions of what once was but is no more. Their fragmented faceless bodies fade from (or into) the image, time, and history. By erasing the already anonymous figures, Sendas shows us a forgotten past that is now made inaccessible, which fosters a desire to unravel and activate the details behind the images. A second series presented in the exhibition is “Peeps,” 2012, based around a group of pinup photographs made by American amateurs during World War II. On top of these images, Sendas superimposes black geometric shapes, which cover their bodies with a sort of Bauhaus-like costume, evoking the ones Oskar Schlemmer designed for his Triadic Ballet, 1922. 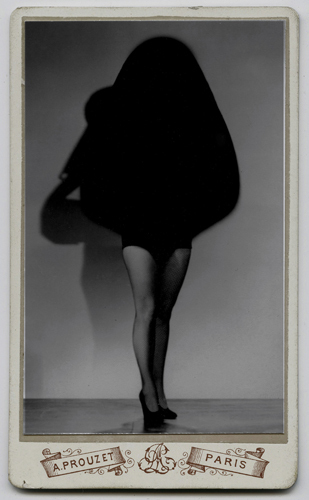 The dressing up of the women with these forms can be understood as an allegory of the censorship Schlemmer’s work faced after being called degenerate.